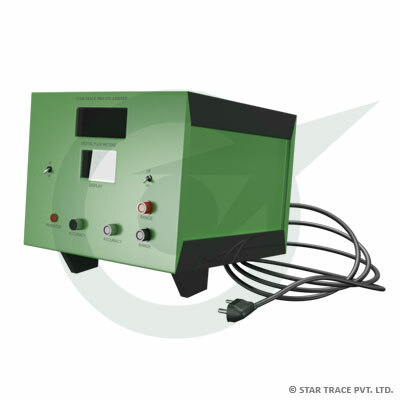 Star Trace has been providing a standard Magnetic Field Meter. The guiding principles have been simplicity, economy and durability. Star Trace Magnetic Field Meter has been established the standard for the measurement of the magnetic flux density for determining the flux in magnet or magnetic assembly. Magnetic Field Meter is instrument made by electronic integration principle and displays the magnetic flux digitally. Magnetic Field Meter can be test magnetic materials. Magnetic Field Meter not only measures flux but also directly tests magnetic performance for the purpose of quality control. With the features of legible display and convenient operation, it is an ideal device for flux measurement.The digital readout also enhance resolution and accuracy of readings. Measuring Range: 103, 10 4, and 106, Kilomaxwell turns with 100% over range protection. Indication : 3 1/2digit panel meter with 12 mm LED. Resolution : 1 Kilomaxwell Turns range. Accuracy : ±0.5% of full Scale. Input Resistance : 10 Kilo Ohms. Drift : Less then 0.5% of full scale per minute on 10'Kilomaxwell turns range. Output Voltage: 1 Kilomaxwell turns range. Input Power : 240 V, 50 Hz, 25 VA.
Output Resistance: 1 Kilo Ohms. Dimensions : 210 x 95 x 225mm, Weight 1 Kg. Optional : Recorder output of 1V across 1 Kilo Ohms. Used in Measuring D.C. Magnetic fields, Ferro Magnetic Detectors, Field Surveyors, Production Test Systems, Voltage Integration, Hysteresis Loop Tracers and Magnetic Shielding Tester. Model STFM 201 Digital flux meter is an advanced version of Model STFM 110. It is a high speed precision instrument which integrates with any voltages signal when applied to its input terminals. It is used as a Digital Flux Meter, Gauss Meter and voltage integrator and also applied in application such as perimeters hysteresis loop tracers, magnetic field surveyors, production test equipment and have many other applications. Model STFM 201 Digital flux meter is completely solid state offers dependable low maintenance service. The read out is a three and a half digit LED panel meter. The four digit scale factor allows the user to get output in Maxwell turns, Maxwell or Gauss. Overall accuracy is ± 0.5% of full scale. Its magnetic sensitivity is 500 Maxwell to 1.999 x108 Maxwell turns. Output terminals provide a signal adequate for driving an X-Y recorder. This feature is useful when DC or AC hysteresis loop tracing is required. Digital flux meter instrument can be instantly reset to zero by means of a reset button conveniently located on the front panel. Range : 500 Maxwell to 1.999 x 108 Maxwell full scales. Output : 1 Volt D.C. across 1 Kilo Ohms. Display : 31/2 Digit L.E.D panel meter. Drift : ± 1% per minute, maximum. Input Resistance : 100 x Scale factor Ohms. Kilo Ohms. Input Power: 240 V, 50 Hz, 50 VA. Application of Magnetic Field Meter is Measuring D.C. Magnetic fields. Ferro detections, Field surveyors, Production at System and Hysteresis loop tracer. Special Magnetic Field Meter can be made on request, Please send us their technical data and application, required for our engineers to provide.